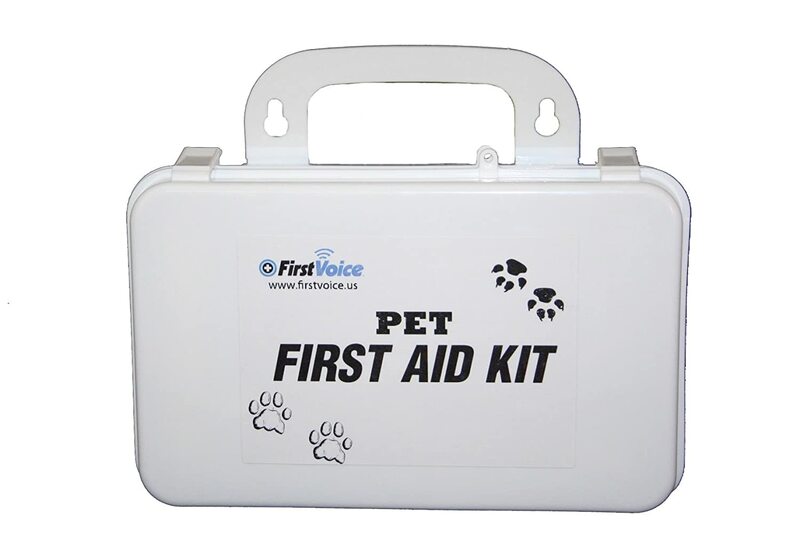 First Voice basic pet first aid kit contains all the items you need in case of an emergency with your dog. First Voice basic pet first aid kit contains all the items you need in case of an emergency with your cat, dog or other critter. The kit includes a pet first aid guide with clear instructions on how to handle different types of injuries and emergencies. All items are stored in a hard plastic case with a handle. Includes: (1) pet first aid guide, (4) - paw adhesive strips (2 knuckle and 2 fingertip), (2) - waterproof tape rolls, (1) - blood stopper trauma dressing, (4) - 4 by 4 gauze pads (2 - 2 packs), (4) - 2 by 2 gauze pads (2 - 2 packs), (1) - 4-inches gauze roll, (2) - pair gloves (non-latex), (1) - instant cold pack, (1) - tweezer, (4) - antibiotic ointment, (10) - BZK wipes, (10) - alcohol wipes, (4) - tongue depressors/splints, (10) - cotton tip applicators, (1) - 4-inches elastic bandage, (4) - sting relief pads. Keep one at home and one in your car so you are never without aid in an emergency.